Triple Cream consists of Dave, Brian, and Harvey. They began their careers as professional musicians working throughout the UK in various venues from clubs to theatres, and were in great demand as session musicians, working on many albums for various artists. They have also performed music for TV advertisements and radio jingles. In the early 80's Triple Cream moved into musical parodies and stand up comedy and realized they had good comic timing and a great rapport with an audience. 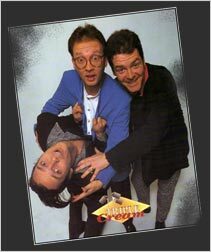 In the mid 80s they were runners-up on BBC TV's 'Opportunity Knocks' and then secured a six week series guest spot for London Weekend Television. In 1989 the line-up changed when Dave and Brian where joined by Harvey and performed on the BBC TV's, Generation Game to great acclaim. In 1994 they spent the whole year working in Bermuda and were invited to work in New York U.S.A. and were a big hit with the audience. Since then they have gone from strength to strength, and are constantly complimented on their originality, ad-libbing and professionalism. Dave was born in Rochford Essex. He began to show an interest in music from an early age and started working as a keyboard player, working professionally in music and entertainment from the age of 15. He then worked with various musicians and entertainers, and in the early part of 1976 formed the beginnings of Triple Cream. It was in the later part of that year whilst at music college that Dave met Brian. At this time Dave was also in demand as a music arranger and writer, and produced music for many acts and artists. Since the development of the comedy act, Dave has continued to grow, in the role as the straight man, but has his own off the wall sense of humour; Dave tends to spend most of his time keeping the other two under control! In January 1993 Dave appeared in BBC TVs ‘Eastenders’ playing piano in the ‘Queen Vic’. Other instruments Dave plays are trumpet and drums. Brian was born in Edgware, London. He was influenced from an early age by his father who was a comedy stage performer in the 40s and 50s. He learned the basics of percussion in one of the country’s top marching youth bands and has since taught drums and percussion in schools and music workshops. Brian met Dave at music college and turned professional. He worked as a session drummer and singer (both lead and backing vocals) for many top names. Brian has also performed on TV and radio doing adverts and soundtracks. Brian has a strong flair for comedy, and is a master of audience participation and tends to play the role of the likeable slightly silly one of the trio. Brian is also an accomplished magician, and is a member of the ‘International Brotherhood of Magicians’ and has worked in the past with such names as Tommy Cooper and Paul Daniels. Yes, Brian can perform minor miracles in front of your very eyes! Born in Thundersley, Essex. Harvey learned to play the piano from the age of 5 & has been involved in music ever since. His first band was called DV8, which he formed when he was 15 years old while attending Southend High School for Boys. At this time, he was also singing in the world-renowned “Southend Boys’ Choir”, soloing on BBC television & appearing at prestigious venues such as the Royal Albert Hall & also performing abroad. .
After leaving school Harvey then had various “normal” jobs until he turned professional, joining his first band “China Blue” in 1987 before moving on to “Triple Cream” in 1989. He has since appeared again on BBC TV and, most recently, in comedy sketches on ITV1’s show “The Warehouse”. As the “cheeky monkey” he is an integral part of the comedy show & is always a hit with the audience. His other musical talents include guitar, bass, saxophone, trumpet & oboe.